What happens when you mix brilliant economic minds and keen educators? An enthusiastic day of discussion, questions, professional development, and yes – even some fun! 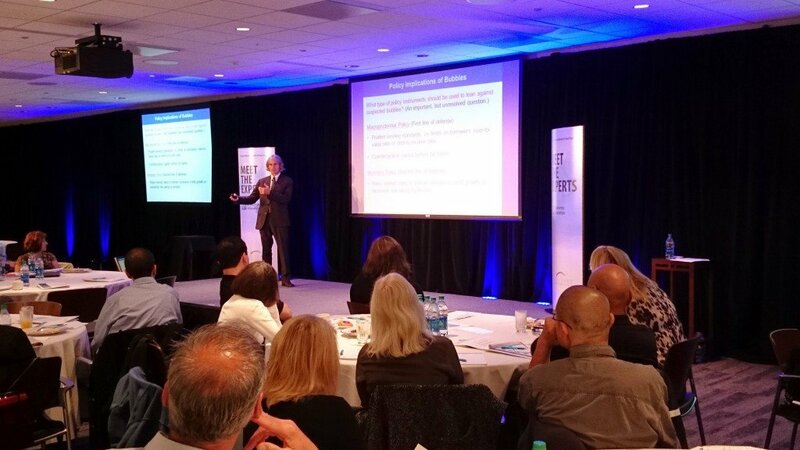 We recently hosted 70 educators from throughout the 12th District at our head office in San Francisco for Meet the Experts (MTE), a speaker series designed to provide secondary and post-secondary educators with an opportunity to interact with leaders from throughout the Bank. With MTE, our objective is to highlight emerging issues in the economy and foster greater understanding about the roles and responsibilities of the Federal Reserve. See how we strove towards that goal with the day’s agenda. Remember to return to this blog in the following weeks as we’ll be providing tips for discussing this year’s MTE topics with your students. The day started off with a dive right into economics content and a very timely topic: asset price bubbles. Kevin Lansing, Research Advisor for our Economic Research group, took the audience through a brief history of bubbles (notably the Tulip Mania bubble from 17th century Netherlands), then touched on three points that explain bubbles: forecasts based on past price movements, social dynamics and human emotion, and market structure. Kevin also discussed policy implications of lessons learned from price bubbles. His presentation slides are here. This post is by guest writer Andrea Abrams, who is a Senior Coordinator with the SF Fed’s Economic Education department. Andrea leads a team of 38 staff outreach volunteers in our Los Angeles and Phoenix Branches who provide tours and personal finance workshops. Read her full bio here. Most students know that the bald eagle features prominently on the United States cash in their wallet. When it comes to frogs, reindeer, and bison, however, students may be in for a surprise. Wildlife meets economics in our nation’s cash past. Some of the earliest American notes were issued by private banks, and often contained imagery that was meaningful to the local community. For example, the currency of Windham Bank, which was located in eastern Connecticut, featured a unique symbol that originated in local folklore. A legend holds that one night in 1754, two local men were terrified by ferocious sounds of battle drawing near. Eager to protect their fellow residents, the two rushed home to gather reinforcements for what was presumed to be an enemy attack in association with the French and Indian War. No attackers were found, but in the morning the area was filled with thousands of bullfrogs who had apparently done battle the night before, possibly over the small amount of water in a nearby pond. This episode was immortalized in poetry and song…and on the local currency when Windham Bank issued a $5 private banknote depicting two frogs in combat. Our Spotlight series continues this week, where we talk with teachers who are making a difference in the field of economic education. 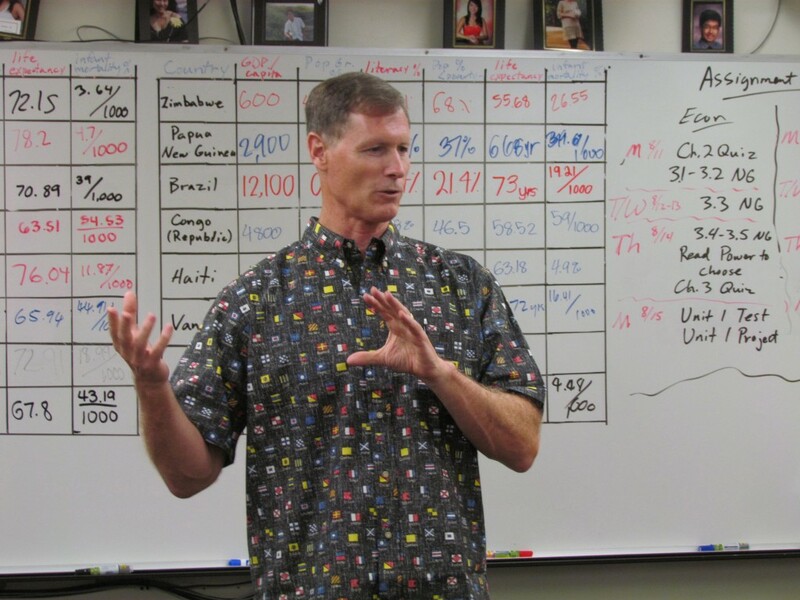 In today’s installment, we’re talking with Stan Herder, who teaches economics, government, and history at Hawaii Baptist Academy in sunny Honolulu, Hawaii. Stan didn’t mention it in his responses below, but we’ll brag for him: He was awarded the 2013-2014 Smart/Maher VFW National Citizenship Education Teacher Award, which is offered by the Hawaii Veterans of Foreign Wars. The award recognized educators who are active in citizenship education, including topics such as government and economies. Stan teaches economics (12th grade), government (9th grade), ancient world history (9th grade), and Hawaiian history (10th – 12th grade). With the summer winding down we’ve turned to getting ready for the new school year, and you probably are, too. To help get the ball rolling with your economics classes, we’ve compiled a short list of “Bite-Sized Economics” activities and discussions that can be easily integrated into the classroom. They come from our colleagues at the Kansas City Fed (see more of their educational resources here). As entrepreneurs invent new products, they often make former products obsolete, or out of date and no longer used. An example of this would be the typewriter, which is now rare because of computer word processing. This concept is called “creative destruction.” Ask students to brainstorm and discuss other examples of creative destruction due to new inventions.